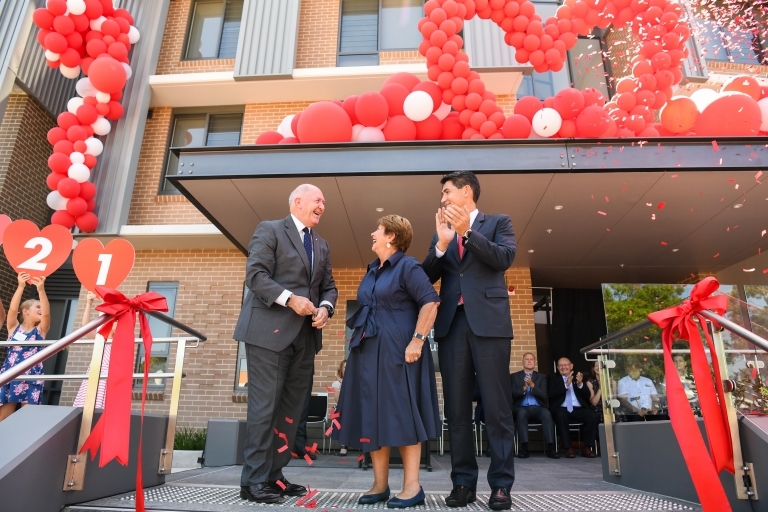 On Valentine's Day, Ronald McDonald House Westmead officially opened the doors to its newest facility and the largest House of its kind in NSW, which will help provide even more families with a home away from home while their sick or injured child is undergoing treatment. Located just metres from NSW’s largest paediatric centre, The Children’s Hospital at Westmead, the new House will offer more than double the capacity of the current House. New facilities include multiple room types, a custom designed fully accessible bathroom, numerous retreat areas, a Learning Centre, health and fitness centre, six individual family kitchens and a dedicated Volunteer’s kitchen. The House was formally opened by His Excellency General the Honourable Sir Peter Cosgrove AK MC (Retd) Governor-General of the Commonwealth of Australia, Her Excellency Lady Cosgrove and Geoff Lee, Member for Parramatta. Following the ceremony, guests toured the new House to experience what will become home for up to 371 people each night for many years to come. “We’re thrilled to be able to accommodate and support more families than ever before, with 1,360 families expected to walk through our doors in the year ahead,” said Belinda Woolford, Executive Officer of Ronald McDonald House Charities Greater Western Sydney. “The realisation of this new House has only been made possible due to the dedication from our Board, staff and volunteers and amazing ongoing support from the government, corporates and community”. Ronald McDonald House Westmead first opened its doors in 1995 and is one of 16 Houses around Australia that are operated to provide essential accommodation and support for families with seriously ill or injured children. The new Westmead House will be open to the public on Saturday 17th February from 12pm-3pm for a Community Open Day, click through for more information or to register to attend.